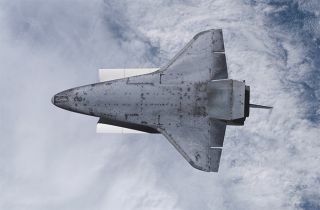 The retired space shuttle fleet used ceramic tiles on their undersides to dissipate the atmospheric heating on reentry, but the tiles were fragile, prone to cracking and often needed to be replaced. Engineers have always liked ceramic parts – they are strong, lightweight and handle heat better than many metals, ideal for crafting parts for airplanes or rockets. Heat-shielding tiles on the space shuttle were made from ceramics, for example. Now researchers have used a 3D printer to make customized ceramic parts that have also overcome the Achilles’ heel of ceramic objects: their tendency to crack. The finding could open the door to a new class of ceramic-body or ceramic-engine jets, perhaps even a hypersonic craft that can fly from New York to Tokyo in a few hours. "If you go very fast, about 10 times speed of sound within the atmosphere, then any vehicle will heat up tremendously because of air friction," said Tobias Schaedler, senior scientist at HRL Laboratories in Malibu, Calif. "People want to build hypersonic vehicles and you need ceramics for the whole shell of the vehicle." Schaedler and colleagues at HRL invented a resin formulation that can be 3-D printed into parts of virtually any shape and size. The printed resin can then be fired, converting it into a high strength, fully dense ceramic. The resulting material can withstand ultrahigh temperatures in excess of 1,700 degrees Celsius (3,092 Fahrenheit) and is 10 times stronger than similar materials. Ceramics are much more difficult to work with than plastics or metals because they cannot be cast or machined easily, according to Schaedler, who is an author on the new study appearing today in the journal Science. But Schaedler's team figured out how to trick ceramics into behaving like plastic. "We have a pre-ceramic resin that you can print like a polymer, then you fire the polymer and it converts to a ceramic," he said. "There is some shrinkage involved, but it's very uniform so you can predict it." The big picture is that this method could help rocket and satellite designers who have to make lots of special small parts that are capable of resisting the heating that occurs during high velocity air friction, as well as high temperatures generated by the exhaust during takeoff. ANALYSIS: Could Ancient Pottery Improve Spacecraft Tiles? A form of ceramic called alumina is being used in new ion propulsion drive, which uses electricity to heat gas and generate ions, according to Charlie Spahr, executive director of the American Ceramics Council. "Ceramics are really good where you want to reduce wear and tear," Spahr said. The Pentagon’s research branch has been funding various projects to discover new ways to build lighter, stronger and more heat-resistant materials for aerospace and military applications. "The method described in the new Science paper brings us closer to the goal of being able to 'engineer in' desired material properties that generally are not found together, such as strength and low density or low weight, and to craft these materials into complex shapes," said Stefanie Tompkins, director of the Defense Science Office at the Defense Advanced Research Projects Agency (DARPA). Figuring out how to make customized 3D-printed ceramic parts could also make a difference in gas-fired power plants, for example, or other types of gas engines, according to DARPA officials.